MagicCatJenny: I'm a NaNoWriMo winner! I did it! It happened last night! I've written 50,000 words this month for my novel titled 'The Park Cats.' 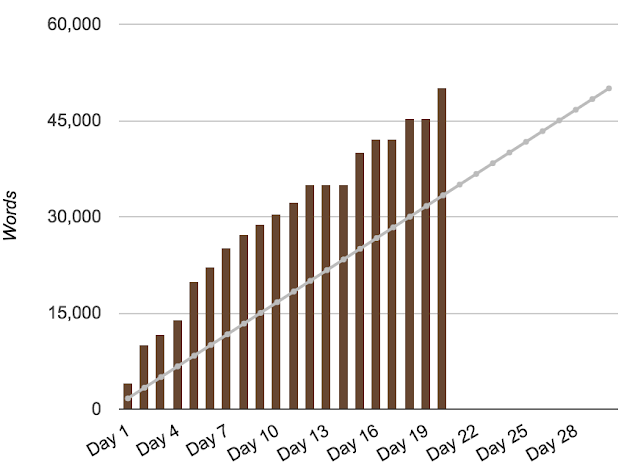 This is the 4th time I've done NaNoWriMo and it's gone, by far, the fastest this time. I can attribute part of that to the subject matter of my story, it's essentially CATS fan fiction with all of the copyrighted elements changed or removed. I've always written my CATS fan fiction as if they were actual cats roaming around a human inhabited world, much like the dogs in Richard Adams' book Plague Dogs. It's also similar to Erin Hunter's Warriors series. I doubt I'll have this momentum if I attempt this again in a year, but it was a fun goal to always be ahead of the game for once (in previous years I tended to hit the bare minimum each day to complete on time). If I decide to keep working on my story beyond this month I know there are a lot of things I have to change about it. I'm hoping by the end of November I'll have a decent rough draft to share with friends, which is something I've never done before with previous NaNoWriMo novels. Other things that have come out of this so far have been a re-read of the Warriors series which led to fan art searches which led to me drawing cat anatomy and logging into my DeviantArt page for the first time in forever. I'm also in the process of making my new CATS costume and I helped a friend sew plushie cats the other day...as we watched CATS. So...it's been a very feline intensive month for me, MagicCatJenny...how appropriate.